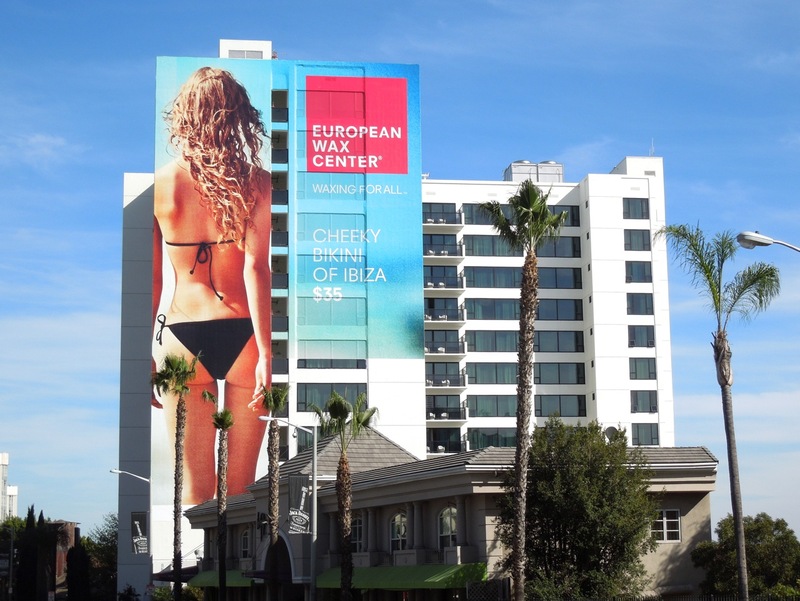 There's nothing quite like spying a beautiful behind to perk you up, so this super-sized billboard for European Wax Center should certainly catch your attention along L.A.'s busy Sunset Strip. It's also a super-sized reminder than Spring is just around the corner and it'll soon be time to get swimming pool and beach ready, especially here in sunny Southern California. This giant billboard on the side of the Mondrian Hotel makes a great impact for for the beauty chain's 429 locations around the U.S., especially now that the ad creative can wrap across the hotel's top floor windows making it an even more eye-catching spectacle. This cheeky bikini billboard was photographed on February 15, 2013 and if you like this ad, be sure to check out some of the other creatives that have graced this location, like UGG Australia's Classic cool billboard, these giant Samsung Galaxy smartphone billboards and this super-sized Rock of Ages movie billboard.